Prague - Eden Arena 05.11.2015: Another stadium that will be presented on our website is the most modern stadium in the Czech Republic – the Eden Arena, originally named the Synot-Tip Arena, situated in the Prague district of Vršovice. The stadium, home of Slavia Prague and place for Super Cup 2013 (Bayern - Chelsea), was officially opened in 2008, in particular on May 7. On the occasion, Slavia played an exhibition match against Oxford University A.F.C, which Slavia won 5-0. And why did they choose to play a students’ team from Oxford? That was because it was the Oxford University team, against which Slavia Prague played its very first match against a team from England. The match took place on 28 March 1899 and at the Letná stadium, the first home stadium of Slavia, and Slavia lost 0-3. The stadium, which has also often hosted international matches, was built by the firm E Side Property Limited. The construction cost approximately 1 billion CZK. However, the present Eden stadium is a completely new construction. At the beginning, it looked differently. The original Eden stadium was opened on 27 September 1953 and had, by today’s Czech standards, an unusual capacity of 38,000. The first match played at the stadium was against Křídla vlasti Olomouc (Olomouc Wings of Homeland). The match ended in a tie 1-1, Pepi Bican, the legend of the red-white team, scored the only goal for the team of DSO Dynamo Prague (original name of Slavia Prague, used for 16 long years). The old Eden stadium hosted many (in)glorious competitions. Apart from Division Two, in which Slavia played twice in the 1970s, and Division One, the stadium also hosted UEFA Cup and Cup Winners’ Cup matches. In 1973 the club started considering a renovation of the stadium, and the city of Prague promised to invest into the entire project. In 1990 (that is 17 years later), after a series of fights and petty arguments, the construction works were supposed to be started, however there was not enough money, so the entire project was dropped. So, in the end, there was no new stadium and the capacity of the present stadium was reduced, as the east stand with standing terraces was demolished in 1989, the year of the revolution. Over the following years, the Eden stadium hosted very few matches. For a while, Slavia played their home matches at the “Ďolíček” stadium, normally the home of Bohemians Prague, or at the Evžen Rošický Stadium, also known as the Strahov stadium. 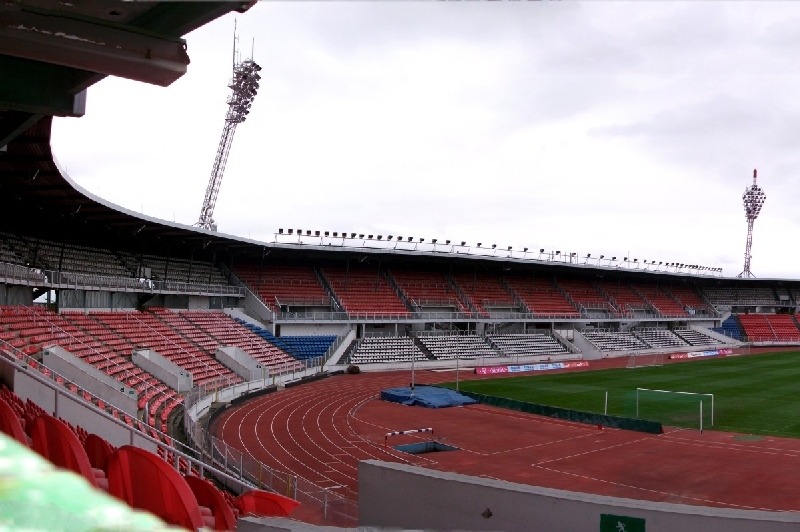 The old Eden stadium hosted the last match on 19 May 2000, Dynamo České Budějovice lost quite markedly 4-1. Plans for a new stadium, i.e. the future Synot-tip Arena, were first put forward in 1997. The demolition of the old stadium begun six years later, by the end of 2003. The construction works were started on 16 October 2006 and completed on 5 February 2008, when the first seats were laid down onto the stands, built on 603 stilts. Apart from seats for spectators, there are also 14 fast food booths – 12 of them can be found in corridors on the ground floor of all stands, and two booths are located in the corridor on the 2nd floor of the west stand. In the west part of the stadium you can find an area of 2,400 m2 reserved for offices, and on the ground floor there is a fan store, McDonald’s restaurant or a bank branch. In the north part of the stadium there is the four-star Iris hotel, with the capacity of 150 rooms. Apart from being called the most modern, biggest and best the Eden Arena is also the most controversial. From the beginning, many questions arose concerning the construction, although they were not nearly as numerous as those regarding SK Slavia. But, all the same. For several months, no one even knew who the owner of the multi-purpose arena was. On 19 July 2012 the Natland Group sold the majority of their shares to Kingwater Holdings Limited, which is owned by attorney Václav Slavíček. This action gave rise to further speculations about the real owner of the stadium. Another thing in favour of the conspiracy theories is the fact that Kingwater Holdings Limited is headquartered in Cyprus. Nevertheless, the Eden Arena is not only a place to watch players run about the pitch. Besides the matches of Slavia Prague, of the Czech national team, and, until recently, also of Bohemians Prague, the Eden Arena also hosts music concerts. The first world-famous band to play in the Eden of Prague was Metallica. And a short time ago, the stadium hosted a concert given by Coldplay. In 2012 the Arena held the 15th Slet (a massive gymnastics festival attended by members of the Sokol movement). Let’s hope that, above all, the Eden Arena will host quality football matches attended by cheering crowds.